Jean Baptiste Louis Franquelin’s Map of Louisiana, 1684, also known as “Map of Louisiana, or the Voyages of the Sieur de La Salle,” illustrates the careful recorded extent of France’s Louisiana and its progress of western discovery. Published following the French possession of the territory, it outlines the boundaries of the newly acquired lands claimed by Louis XIV. The map is compiled from knowledge gained from the exploration of Robert de La Salle and Louis Jolliet in the interior of North America. Who was Jean Baptiste Louis Franquelin? Born in France in 1650, Franquelin moved to Quebec, Canada in 1671 to trade. 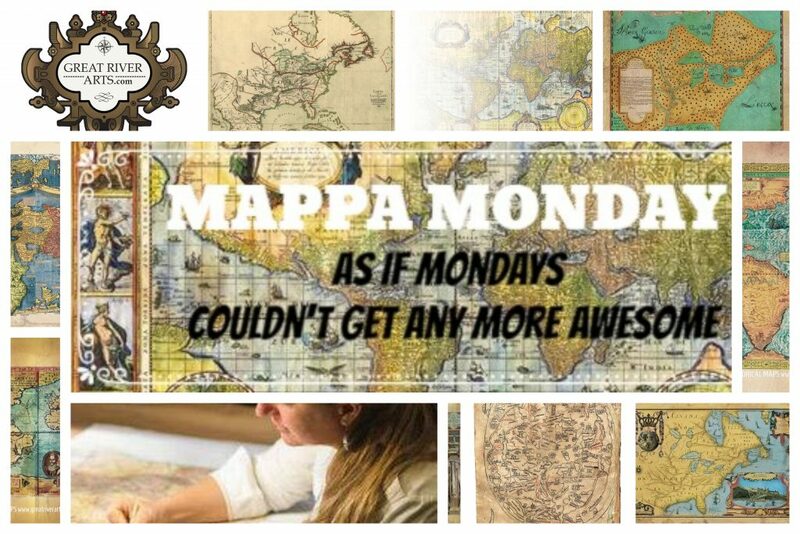 However, he shifted his focus to map-making, became a royal hydrographer in 1686, and the first official cartographer in Canada. Interesting to note about this early map is that it depicts place names that have been existence to this day. The origin of many of the names can be found in rivers, for example, Chekagou (Chicago), Illinois (both a lake and a river), Misconsing (Wisconsin), Cansa (Kansas), Ohio and the Ouabache (Wabash). Common Native American tribal names that also represent particular rivers can be identified, including the Zages (Osages), the Tchacta (Choctaw) the Tounica (Tunica), the Acansea (Arkansas) and les Ci-Ca-Ça (Chickasaw). Did you know that Jacques Marquette and Louis Jolliet were the first Europeans to come in contact with the Osage Indians? It is held that in the early 1670s, Marquette and Jolliet were the first to make contact with the Osage. Dominant in the fur trade along the Missouri River, these great traders established a strong fur trading link with the French beginning in the 1700s. 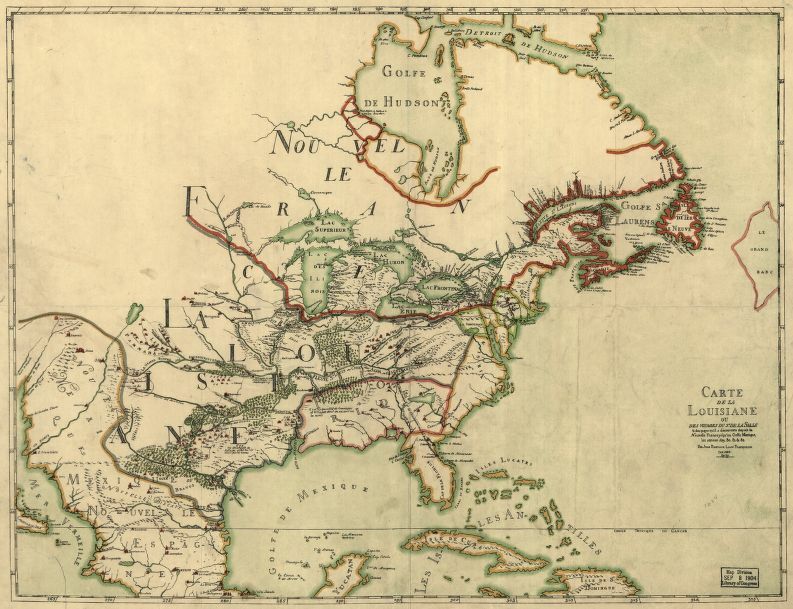 Evident on the map in detail are notable regions like the Louisiana Territory, Florida, New France, New Spain, the Gulf of Saint Lawrence, and islands in the Caribbean. There are glaring distortions on the map, including the braided depiction of the lower Missouri River, which gives the impression that the Osage and Kansas Rivers meander in a way that form islands in the river, or the illustration of the Mississippi River entering the Gulf of Mexico miles west of its true location, an unfortunate inaccuracy portrayed for several years before it was corrected on later maps. The Great Lakes are presented in detail, with lake Michigan as Lac Illinois and Lac Frontenac as Lake Ontario. Franquelin’s Map of Louisiana served to cement French claim to the Louisiana region against potential contest from other colonial powers.